Wolf Grace Designs - Necklaces and Jewelry for dogs - Free Shipping! The wind rustles the leaves in the trees, the grass blows gently across the plains and your dog�s free-spirited mind dreams to frolic through the fields of wildflowers, just as the wolves did, centuries ago. This necklace was designed with the free-spirited Native American colors in mind. After all, dogs are decedents of the wolf, which were thought highly of by those who treaded these grounds long ago. The wolf represented everything that dogs continue to represent, such as courage, strength, success, and above all, loyalty. 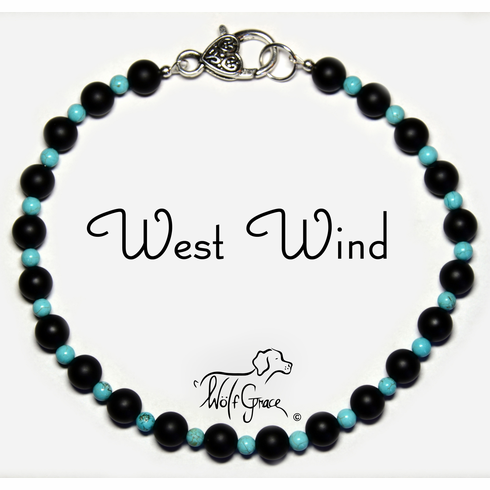 Pay homage to all the wonders of your dog and their ancestors, with West Wind. The color Turquoise represents wisdom, serenity, and love. While Magnetite was used personally by the Native Americans for jewelry making and often times as currency. Which makes these 3-4mm Round Turquoise Blue Colored Magnesite beads, all the more historically important to the design. We selected the 8mm Round Matte Black Agate Beads, with history in mind, as agate was often said to offer protection while encouraging a calm body and soul, as well as cleansing the spiritual mind. Weather you admire the age of simplicity before the rapid pace of the 21st century came to be, or just have an appreciation for the past and want to share the history and heritage with your furry best friend. Whatever the case, you will simply adore the fantastic colors and style, because this necklace is sure to please with its vivid color combination. So the beads leave their mark as long as possible, as with all of our necklaces, these beads are strung on Sterling Silver jewelry-grade wire. Notice on each end of the necklace, how the Sterling Silver crimp covers reinforce and conceal the Sterling Silver crimps, which hold the beads securely in place.